(216) 961-6298 reservations: book online now. Built in the 1880’s in the Romanesque Revival style from locally quarried Berea sandstone by its namesake Robert Wallace, a shipping magnate, Wallace Manor continues to be one of the more significant structures on Franklin Blvd. Built in the 1880’s, Wallace Manor has redefined itself several times. Primarily a single family home, the property had large spacious rooms, boarding and work room for the servants, and a matching carriage house in the rear. During the time of the great depression, the house was converted to a boarding house and remained that way until the mid 1970s. At that time it was put back into use as a single family house although much of the remnants of the boarding house remained. This great structure was completely restored / renovated beginning in the mid 1990’s over a period of 18 years. 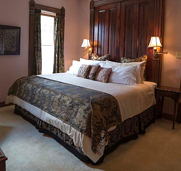 The Wallace Room is so named because of the original restored massive pockets doors, from the Manor, that have been made into the headboard of a king size bed. The attached bath includes original fixtures from the house as well. The Walnut Room features exotic walnut paneling and molding that wrap the welcoming fireplace. This is the only bedroom in the house that still has its original hardwood floors with detailed inlay. 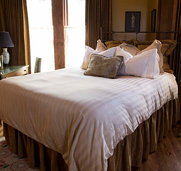 The Blair Room features a king sized bed, Sterns and Foster mattress, and floor to ceiling headboard. This room also includes a wall mounted 42" LCD TV and a heated bathroom floor. The included bathroom also has a shower with two showerheads. 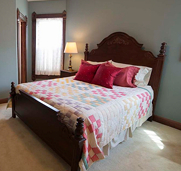 Photographs of Cleveland adorn the walls of this bedroom. Pay special attention to the “tile rug” in its attached bathroom. This room is also the only room with a walk-in shower.